If you don't like dealing with the corrosive ammo found in surplus "spam cans" of 5.45x39 ammo, try this new production from Silver Bear. These cartridges are also made in Russia, but use non-corrosive Berdan primers and zinc-plated steel cases for better cycling and storage. They'll shoot just as well (or better) than military surplus and shorten your AK-74 maintenance routine significantly. 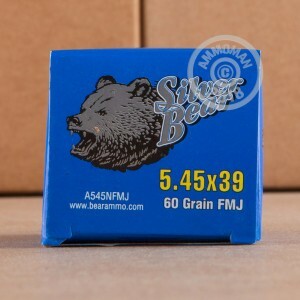 Silver Bear ammo comes from the Barnaul Machine Plant, which produced half of the ammunition used by the Soviet military during World War II. Today, the plant operates as a business with significant worldwide exports. 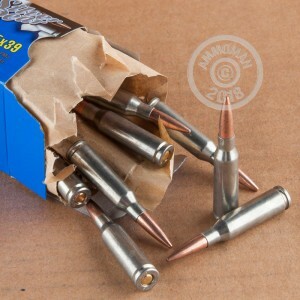 Each cartridge in this case of 750 (25 boxes of 30 rounds each) fires a 60 grain bimetal jacketed bullet. This ammo is slightly magnetic due to its steel components, so it may not be allowed at all indoor ranges. Buy this case or any other items over $99 at AmmoMan.com to qualify for free shipping!